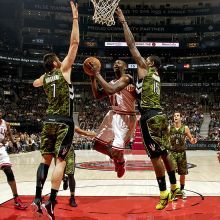 Without MVP Derrick Rose and trailing by eight points with just under nine minutes left to play, the Chicago Bulls were on the fast track to defeat against the Raptors Wednesday night at the Air Canada Centre in Toronto. But a recurring theme this season played out spectacularly well for the upstart Bulls, whose bench once again came to the rescue and engineered a stirring 20-run that capped a jaw-dropping come-from-behind 94-82 triumph. Down 72-64 in the final frame, John Lucas ignited the rally with five straight points that cut the Bulls deficit to five at the 8:10 mark. Kyle Korver kept the attack going with a 3, followed by a rim-rattling Taj Gibson dunk off a Luol Deng alley-oop assist. And just like that, the Bulls took a 74-72 lead and never looked back. In an amazing display of offensive might, the Bulls lit the final 12 minutes for 32 points. It was their 20th road victory of the strike-shortened season and fifth straight away from the United Center. At 39-10, Chicago holds the best record in the NBA with Miami nipping at its heels with a 34-11 slate. Lucas tallied just 13 points, all in the fourth quarter. But his offensive explosion and team direction couldn't have come at a better time as the Bulls, who shot just 36-of-82 from the field (43.9 percent), struggled to find their rhythm almost all night long. "He's doing more and more. He's doing some shooting and moving right along," Bulls coach Tim Thobodeau said of Lucas, who also had four assists and two rebounds in 17 minutes of action. The Bulls will need Lucas to continue to be a sparkplug off the bench as Rose, who missed his fifth consecutive start, continues to recover from a sore groin. LUOL Deng led Chicago with 17 points and 10 rebounds while CJ Watson had 15 points and three assists manning the point-guard spot. Big men Carlose Boozer and Joakim Noah combined for 16 points and 11 rebounds while Ronnie Brewer added 12. Korver finished with 10. DeMar DeRozan led the Raptors with 23 points and 6 rebounds. James Johnson had 16 while Jose Calderon chalked nine points and eight assists. Toronto, which was hammered off the boards 49-41, converted only 35 of 85 shots for a measly 41.2 percent. The stunning reversal was Toronto's third straight loss and seventh in 10 games. The Raptors dropped to 15-32 in the standings and are hopelessly out of the playoffs picture in the East Conference.